Their main occupation was war-often between them but also against their neighbors, especially the warlike: the Germans . These, great warriors, drove the Helvetii to the interior of Gaul, upsetting the delicate balance. Eduens, tablets this Swiss thrust, appealed to the strong man of the moment: Julius Caesar. JC. Julius Caesar , at the head of his Roman legions swept over Gaul. The Gallic tribes organized resistance under the authority of a charismatic leader: Vercingetorix . The Arverne, great unifying, but lacked military experience. In 52 BC, after the defeat of Alesia (despite a clear numerical superiority), Vercingetorix laid down its arms at the feet of Caesar . The victorious emperor took the road to Rome, crossing, with his legions, the Rubicon (when it was banned), chasing the same time the master of the house: Pompey (his son). Roman Gaul was and remained until 486 AD (Battle of Soissons). Julius Caesar became dictator for life. Assassinated in 44 BC by Brutus, his adopted son, he left the throne to Augustus, the first emperor of a sad series, the most famous was Nero (incendiary Rome) and Caligula. For three centuries Gaul enjoyed a calmer period: the Pax Romana , the Roman peace which allowed its economic development. The Latin replaced the Celtic and the Gauls adopted Roman names. Druidism was abandoned, developed communication channels, marshes drained, rivers opening domesticated for agriculture additional land. But the powerful protector (Rome) shook under the repeated blows of the barbarian hordes coming from the eastern borders of the Empire, threatening Gaul. Occupied Rome, the emperors could not intervene . Alans, Vandals (who will occupy northern Africa) and Sueves plundered Gaul. Then it was the turn of the Burgundians (which give their name to the Burgundy), the Visigoths (who will be moving into the south of Spain), and the scourge of God ( Attila ), and finally salt Franks , came from East, who won under the leadership of ClovisThe Battle of Soissons in 486 AD hunting, at the same time, the last avatar (Syagrius) Roman Gaul. The Roman Empire reached a troubled period, characterized by the simultaneous presence at its head two Caesar and much Auguste. Constantine ended the Tetrarchy. Then he converted to Christianity (324), carrying with it the empire. A new capital, which bore his name, was founded in 324 Constantinople (now Istanbul). Clovis understood how religion could cement its territory. He followed the path taken by Constantine , and in 498, converted to Christianity. This political act allowed him to submit rival tribes. The Gaul was now a kingdom frank and Christian. Merovee, grandmother of Clovis, gave his name to the first dynasty of the Merovingian. Monarchs more or less enlightened succeeded according to the rules of the Salic law: Thierry Childéric Thibaud, Clotaire Dagobert (who added the Burgundy kingdom). 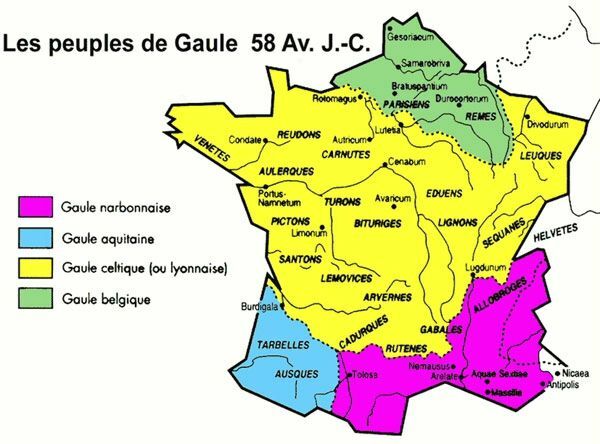 At its peak, the Merovingian kingdom covered the Belgium , part of Germany , the Switzerland and of course the Gaul. In the eighth century, the prophet of Islam , Mohammed, conquered the entire Arabian Peninsula. By fanatical religion, his successors ( Sunni dynasties Umayyad then abassydes) swept into North Africa and Spain. The Muslims invaded Gaul from the south. In 732, Charles Martel (the grandfather of Charlemagne) became famous in Poitiers stopping Arabs and thus saving Christianity. The last Merovingian, Chilpéric III, was deposed by the son of Charles Martel, Pippin said the « short » (with the encouraging of the Pope). Charlemagne succeeded his father Pepin and gave his name to the new dynasty: the Carolingian. With his victories, including the Lombards , the Muslims of Spain and the Saxons , he took the title of Augustus and Emperor (he received Pope Leo III ), as in disuse since the fall of Rome . His empire covered an area of over one million square kilometers (France, Italy, Germany). 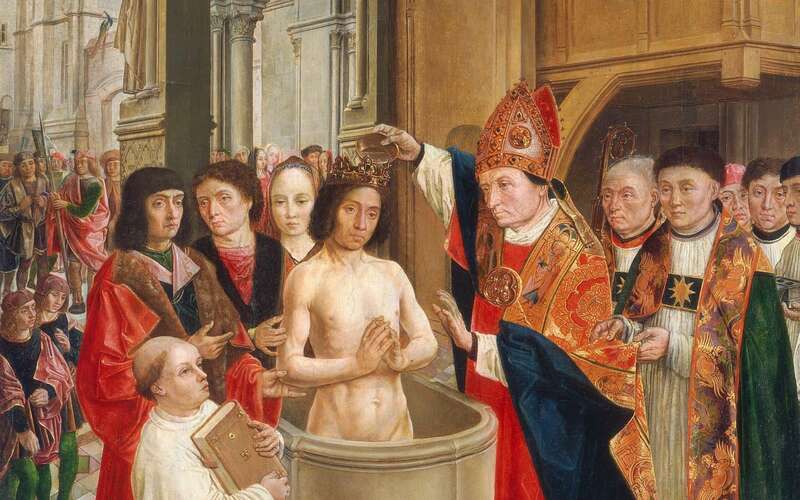 Charlemagne (Charles the Charlus Magnus or large) developed education and not just religious. But the weakness of the Carolingian dynasty remained the Salic law : Charlemagne left his kingdom to his three male heirs who, of course, disputed inheritance. Louis V was the last Carolingian. In 987, Hugh Capet was elected King of France and gave his name to the third dynasty, the Capetians . A thousand years of obscurantism began: the king by divine right, all powerful, supported his authority over the Church and feudalism, the real backbone of the kingdom, life was good for some and poverty for others warranty. The scientific progress was slowed by the Church which prohibits questioning the Book of truth, otherwise pyres. The kingdom was then divided into three categories: those who prayed ( the clergy ), those who fought and administered justice ( Nobles ) and finally, the last working ( the serfs ) serving the first two (orders). Constantinople (capital of the Orthodox Christian empire) was threatened by the Persians and the Muslims . They occupied the holy places ( Jerusalem , the seat of the Holy Sepulcher , of Golgotha , the temple of Solomon , but also the third holiest city of Islam). In 1095, with the aim of releasing these holy places, Pope Urban II ( the French) asked the help of the Frankish king. This was the beginning of the Crusades. Godfrey de Bouillon took the lead in the first and drove the Muslims from Jerusalem. Baudoin (the leper) became king of Jerusalem. Saladin (general Kurdish Sunni ) remobilisa Muslim armies and defeated the Crusader army, exhausted by a long march in the desert. Jerusalem was a Muslim again. In 1152, the Duchess of Aquitaine married the tale of Anjou, Duke of Normandy Henry Plantagenetbecame king of England under Henry II name. England set foot in France. The seeds of the Hundred Years War were planted. Philip Augustus, with the victory of Bouvine in 1214, maintained the unity the kingdom of France, threatened by England and Germany. The Hundred Years War began in 1328. Decimated at Agincourt (1415) , the nobility of France was threatened with extinction. She was rescued by a first time Dugesclin and a second by Joan the Maid (Arc) that bouta, in 1430, the English out of France. In 1475, the Treaty of Pecquigny Louis XI came to France this endless war. The English no longer occupied that Calais . Since 1450, France had virtually its current borders, with the exception of its eastern fringe. With Francis I began the Italian adventure that culminated with the victory of Marignan (1515) thanks to the exploits of the Knight Baillard that adouba Francis. The rise was also economic. Lyon became a crossroads of European trade. The Loire castles were built and Montaigne wrote his Essays. La Boetie, his friend, is interrogait, seeing the thousands of peasants in serfdom, the reasons that explain this Easement Volunteer. It was a forerunner of the Enlightenment. The use of French became compulsory. Jacques Cartier discovered Canada. The Christian religion, which since Jesus Christ preached love of neighbor, was at the origin of deep and deadly upheaval. Pope Paul III in 1540, had restored the courts of inquisition and sent Ignatius Loyola and his Jesuit put some order in the French faith. But Luther in Germany, on the one hand, and Calvin in Switzerland and France, on the other hand, pushed the Reformation: The return to the origin of the faith, the end of the Clergy, the intermediary who usurped the divine power to his advantage. 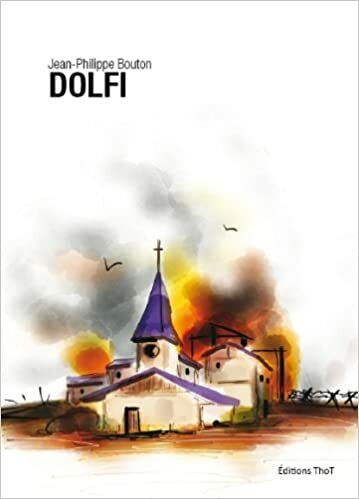 They demanded the end of indulgences, the Mass in French (the use of Latin for the clergy in fact retain a monopoly on holy texts that they alone understand and therefore interpreted to their advantage). Henry of Navarre , one of the few surviving Huguenots of St. Bartholomew, entered Paris with the famous: Paris is worth a mass. He became King of France under the name of Henry IV by abjuring, political calculation, religion and converting to Catholicism. In 1598, he signed the Edict of Nantes, the first text on religious tolerance. Sully straightened finances. But on May 16, 1610, Ravaillac stabbed the good King. Louis XIII succeeded him. The fight against Huguenot started up again. Richelieubecame head of the Council (Prime Minister). intelligent man, he understood that France needed its « reformers » to run the economy. He sought a compromise. 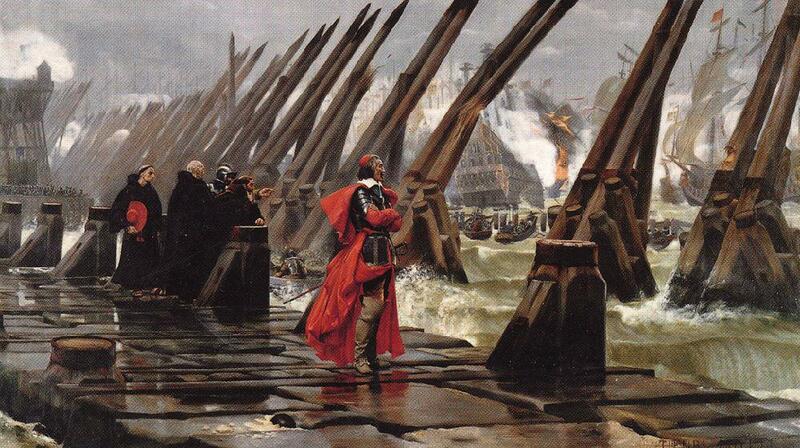 But Protestant England blowing on the embers still vivid, Richelieu took La Rochelle, strong major place of Protestants. Louis XIV was still under the tutelage of Mazarin (successor of Richelieu ), when receiving the throne inheritance. He underwent the sling lords who challenged royal authority. To protect his crown, he transformed the nobility of swords nobility dresses, attracting the nobility at the court of Versailles where he could easily watch her. Tocqueville brilliantly decry the result of this transfer in his famous The Old Regime and the Revolution. By removing the provincial lords, he allowed the enlightened bourgeois administer provinces. A new elite born. It will cause a century of Revolution. Nobles retained their privileges, although they no longer exercised their ancestral tasks: security (serfs) and justice, which justified them. A new elite and unjustified privileges: everything was ready for the Revolution. It was also the time of the creation of large factories in, like Goblins, encouraged by Colbert. 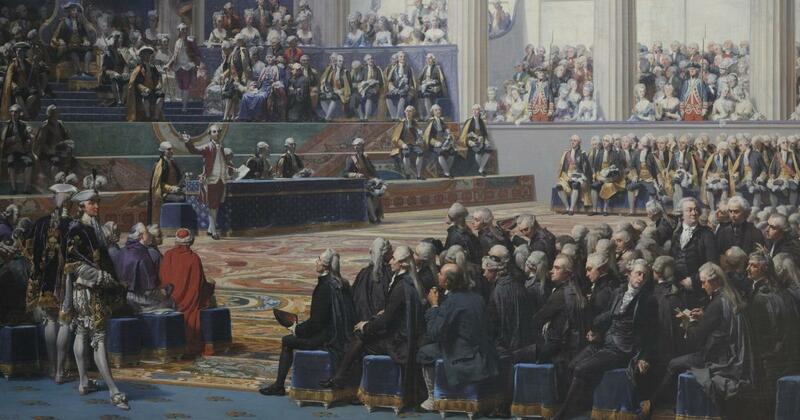 With Louis XV , the phenomenon described by Tocqueville grew louder. The upper class had access to culture, the sovereign functions and wealth. Some bourgeois, like Voltaire , became much more enlightened than some Nobles and often richer! The revolutionary ideas germinated in many authors: Rousseau and his Social Contract , Montesquieu and his Spirit of Laws . Secularism as a guarantor of freedom and tolerance was a concept that many thinkers are rallied. Louis sixteenth name, paid the bill left by his ancestors. Indebtedness of the kingdom, famine due to crop failure, it was enough for qu’éclatât the Revolution prepared by the enlightened bourgeois elites already mentioned. The third of the deputies then went to the room of the tennis court (under the authority Bailly , Mayor of Paris) where they vowed not to separate before the France with a constitution. The return of Lafayette there was nothing. Under the leadership of Camille Desmoulins , outraged by the dismissal of Necker, Parisians took the Bastille on July 14 . Delaunay , its governor was murdered. The National Assembly was constituted and recognized by the King of appeasement pledge. He hung his hat on even the tricolor that handed him Lafayette, appointed commander in chief of the National Guard. The abolition of privileges was passed August 4, 1789 and the declaration of human rights and citizen played by Lafayette on August 26 the same year. But the cons-revolution was already underway in the Vendée first, but also the eastern borders of the kingdom where the exiles waved the King of Prussia and Emperor of Austria. Brunswick , Prussian general in chief, threatened the city of Paris reprisals. This initiative served only to galvanize the revolutionaries. To eliminate any risk of flashback, Saint-Just, Robespierre faithful, demanded the death of the King, opponents of rallying: « a king must reign or die! « He threw the Assembly. The attempted flight of Louis XVI ended June 20, 1792 in Varennes. The people, who would probably be satisfied with a constitutional monarchy, finally lost confidence in his King. The King was brought to the Tuileries, his golden prison. 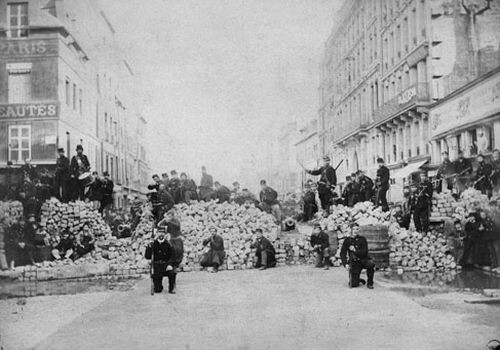 Spurred Highlander Danton, the Paris Commune passed in insurgency mode. The Tuileries were taken August 10, 1792 with the help of federal Marseilles and Brittany. The King took refuge with his family in the National Assembly before being taken to the Temple prison. The King is guillotined on January 21, 1793. 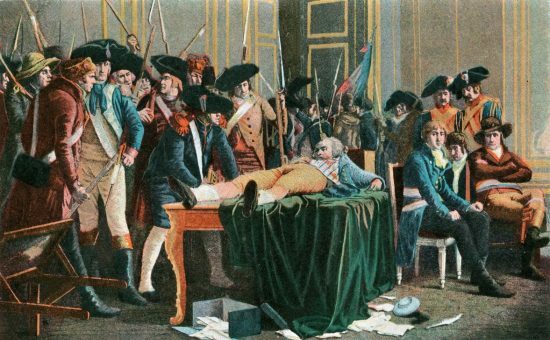 The Convention, the seat of legislative power, was the scene of a violent clash between the Montagnards (far left) of Robespierre, Saint-Just, Danton and Marat and the Girondins (center-left) Brissot and Vergniaud. The Chouans , west, revived against the revolution. Danton , Minister of Justice, set up the revolutionary court. Marat, who demanded « 100 000 head, » was assassinated by Charlotte Cordet . The last moderate Girondins, were arrested and guillotined. 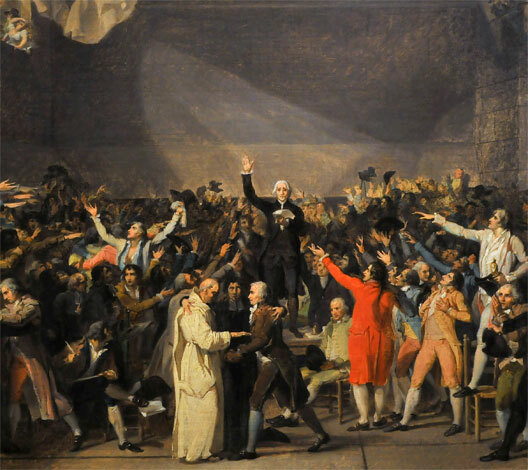 No one could oppose the rise of Robespierre which established a regime of terror, with the support of the Paris Commune of Jacques Hébert and sansculotte of Babeuf the father of communism. Desmoulins and Danton , Robespierre who annoyed by their incessant appeals for clemency in Le Vieux Cordelier, were guillotined. Robespierre became the strong man of a country in turmoil that began to frighten the crowned heads of neighboring countries. The guillotine Samson then operating at full capacity. The European monarchies massed their troops to the borders of France. They were crushed in Valmy. Robespierre locked himself in a paranoid delusion, guillotining the chain opponents and inventing the cult of the Supreme Being. His tyranny was denounced by Tallienand Barras. On 9 Thermidor, he was arrested at City Hall. He fired a shot in the jaw. He was patched up and led to the scaffold, leaving a vacuum at the state summit. The vacuum was filled by a Management Board headed by Barras. The country was through with terror. 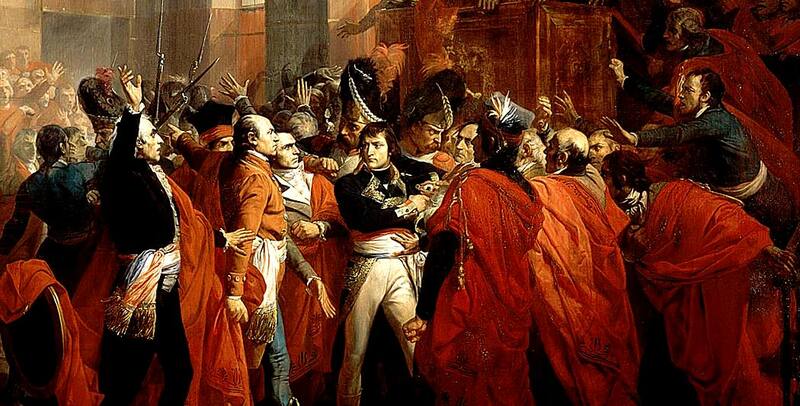 Bonaparte, who had been noticed by Barras at the Siege of Toulon, married Josephine de Beauharnais , then took the head of the army of Italy, won decisive victories over the Austrians at Arcola and Rivoli, allowing for refloat the Management funds. He was then given a new mission: to cut the road to India the English taking Egypt. It was half a failure. He left the army and returned to Paris. He organized for the 18th Brumaire, a coup to overthrow the Directory. With the help of his brother Lucien , President of the Chamber of five hundred and Murat , he took power by force. Bonaparte became Napoleon and appointed Consul alongside Sieyes and Ducos , then First Consul, and after the victory of Austerlitz, Emperor (1804). Talleyrand, Bishop of Autun, entered the political arena by Barras under the Directory, became his Foreign Minister and Fouche n n Police Chief. The European dream of the Emperor ended at Waterloo in 1815 . He left the civil code (inspired by Justinian Code) and went to St. Helena. A brief recovery followed with successively Louis XVIII, Charles X, who was forced to abdicate after the so-called revolution three glorious (27, 28 and 29 July 1830), and Louis Philippe, of the Orleans branch, which became « King of the French » ( and not more than the King of France), in the framework of a constitutional monarchy: the July monarchy . Popular in the early years of his reign, Louis Philippe lost the confidence of the people with the impoverishment of the working classes which was originally the third Revolution of February 1848, which is illustrated Lamartine which led to his abdication, Louis-Philippe refused to fire on the people! Louis-Napoleon Bonaparte, nephew of the Emperor, was elected President of the Second Republic scene of a fierce struggle between the radical left (The Mountain), Bonapartists and Monarchists. Unable to stand at the end of his term of 4 years, the nephew of the Emperor organized a coup on December 2, 1851. Louis Napoleon Bonaparte, said Napoleon III became emperor in 1852. He modernized France, intervened in Crimea (already) against the Russians, but was defeated in 1870 in Sedan (because of the carelessness of General Bazaine), by the Prussians, who marched on Paris. The Third Republic was proclaimed. The town of Paris refused to surrender the capital rose. Thiers , strong of his « Versailles » crushed the revolt of Parisians in a bloodbath. But ideology was born: communism. Jules Ferry gave the colonial impulse and France set foot in Algeria and Tonkin . Jules Ferry also laid the foundation of the school of the Republic. Java gave voice left, supported (and sometimes fought) by Clemenceau radical. The Bonapartist parties and royalists continued to threaten the stability of the republic. Clemenceau knocked ministries before being called inside where he made a name: first cop of France by creating his famous brigades (Tiger). Anti-Semitism was so banal. It showed in the press (Edouard DRUMONT) and running through the halls of the assemblies. The case Dreyfus at the turn of the century, was the most famous example. The journalist Theodor Herzl will use these events to bring out the Zionist idea to create a state in Israel for the Jews. The Dreyfus affair divided France with one hand, the conservative right (anti-Dreyfus) and the other pro-Dreyfus left (in which distinguished themselves Clemenceau, Zola and Jaurès ). Captain Dreyfus, accused of treason, was eventually acquitted. France could concentrate on the organization of the 1900 World Fair where it introduced the Eiffel Tower. The Kaiser Wilhelm II and his chancellor Otto von Bismarck (already winner of Napoleon III ), confident of their strength, wanted to provoke France. The assassination of the Austrian Archduke in Sarajevo by a Serb (the organization The Black Hand), triggered a mechanism of alliances leading to conflict. Austria wanted to settle accounts with Serbia, supported in this by Germany, which had the support of the Empire OTTOMAN. Serbia con side, received the support of the Orthodox world, including Russia allied with France and Britain. The world war was inevitable. After the incursion of the German armies on French territory, the front stabilized in trench warfare. Russia withdrew from the war (Treaty of Brest-Litovsk) after the seizure of power by the Bolsheviks (1917). The Kaiser then concentrated his troops on the Western Front before the arrival of the Americans of Pershing . But it was too late . Clemenceau proved to be the man for the job. It forced Germany to demand the surrender. He was the father of Victory. Pétain , meanwhile, became famous in Verdun. The Treaty of Versailles (1919) settled after the war, regardless of the conquered peoples. He was experienced as a « diktat » by the Germans and will cause the next war. Meanwhile, the country is rebuilt. The interwar period saw the spread of socialist ideas and the occupation of factories. Blum , who won the elections with the Popular Front (1936) , the vote was forty-hour week and retirement at 65. Across the Rhine, Germany, strangled by the severe conditions of the Versailles Treaty (denounced by the British economist Keynes) sinking into poverty and hyperinflation. 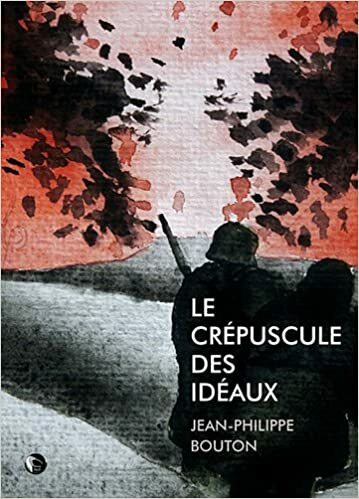 The hatred of the French settled in a still hesitant society between the socialist ideals (embodied by the Spartacus League and the Communist Party of Rosa Luxemburg and Karl Liebknecht ) and nationalist (embodied by the Nazi Party of Adolf Hitler ). Hitler came to power legally (1933) with 30% of lanes on a national and socialist program. He spread the old Marshal Hindenburg and assumed the title of President and Chancellor. He banned political parties, put in place its segregation policy and rearmament of Germany. Following the Treaty of Munich (1938), where Chamberlin (for the British) and Daladier (for French) left him a free hand, he annexed the Sudetenland (German frank Czechoslovakia). He did the same with Austria (the Anschluss ) and with Poland. In 1939, he launched (as he wrote in Mein Kampf) Chariots of the Ardennes (1939). The Nazis were in Paris. De Gaulle saved the honor of France by launching his call from London on June 18 The French government withdrew to Bordeaux, divided on what to do. Paul REYNAUD , Chairman, resigned on June 16 and was replaced by the heroes of the great war: Marshal Petain . The government took up residence in Vichy in the free zone and the National Assembly gave full powers to the old Marshal « in order to promulgate a new constitution of the French state. » The Third Republic was not and gave way to the French State. On 3 October 1940, the first laws of the Jews were promulgated and France pledged on the collaborative way. Free France was still fighting in North Africa. At El Alamein , she managed to stop the armies of Rommel . Winds turned: Allied landings in Provence, and Normandy (June 6, 44), Stalin strong pressure on the eastern front, including Allied bombing Dresden, Germany was out of breath. Paris was liberated and outraged Germany surrendered. Churchill , British Prime Minister, great visionary, denounced the « iron curtain » that fell on Europe. The Cold War lasted until 1989 with the fall of the Berlin Wall. On 18 April 1951, the Treaty of Paris establishing the first European community (including France, Italy and Germany) was signed. The ECSC became the European Coal and Steel Community. On 25 March 1957 , were signed the Treaty of Rome creating the EEC, the European Economic Community. The Fourth Republic is unstable, De Gaulle once proposed a Fifth Republic (1958), which aimed to give a strong executive in the country. He became the first president (head of the RPF) of this Fifth Republic. In 1954, at Dien Bien Phu in Indochina was lost. 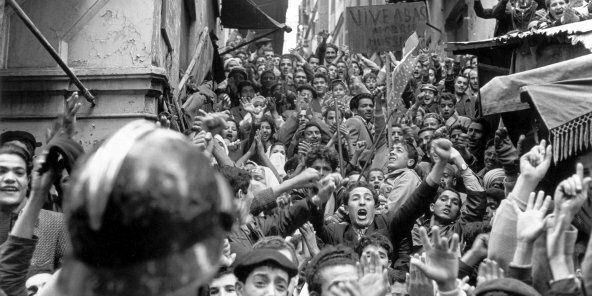 Then it was the turn of Algeria after the Evian Accords in 1962. Ben Bellah became the first president of the independent Republic of Algeria). It will be followed by Boumedienne and Chadli . France also lost Tunisia, Morocco and Black Africa. May 1968 will not change much, the French voting for conservatism wanted after all over. Pompidou assured after-sales service. May 1968 also marked the beginning of sexual liberation. The July 1, 1968 also saw the establishment of the customs union in Europe. The first oil crisis marked the end of the « thirty glorious years (1945-1973). » France, for the first time since the liberation, knew unemployment. The Centrist (UDF) Valéry Giscard d’Estaing became famous (1974) as the first President of the deficit , imitated by the Socialist François Mitterrand(1981 and 1988). The Maastricht Treaty was signed on 7 February 1992 . He gave European integration a new dimension. The European Union « (EU) replaced the EEC with the objective to provide Europe with a political dimension. In 1999, the single currency Euro (€) was born. Conservative Nicolas Sarkozywas elected in 2007. Shortly helped by the crisis of premiums, it undergoes deficits. With the socialist Hollande (2012) , the deficit crosses the threshold of 2000 billion. Since the single currency (2000), financial speculation is no longer made between currencies. She moved to another playing field: the sovereign debt of various countries in the euro zone who borrowed at rates up to 10%. Competitive devaluation was no longer possible to restore the accounts of the country, as in the days of Pierre Mauroy (1981). The ultra competitiveness of German companies could then be expressed in the euro area, where it exports over 70% of its products. The European wealth took the road to Germany. The most vulnerable country, Greece, Italy, Portugal and Spain, but also France accumulated deficit, raising fears the explosion of the euro area. Totalitarian regimes of the Muslim world fell one after the other from the Tunisian Arab Spring (2011). Ben Ali in Tunisia, Mubarak in Egypt, Saddam Hussein in Iraq (driven by the US intervention of 2003) GaddafiLibya was removed from power, leaving a vacuum quickly filled by mainly Sunni jihadist groups. 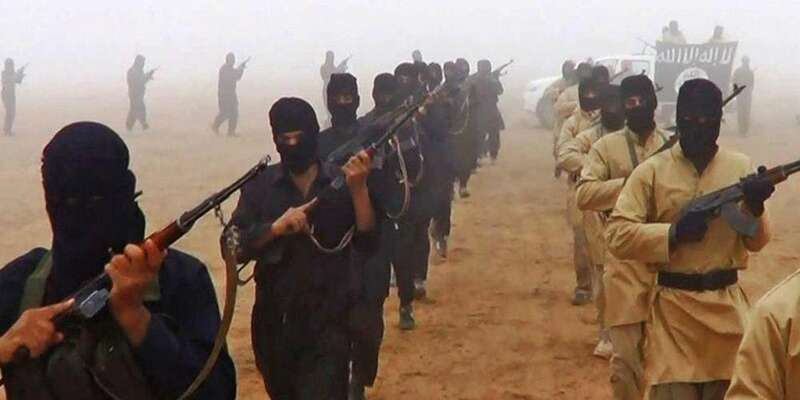 The Islamic State invades large swathes of territory in Iraq and Syria. France is engaged airstrikes and experienced a wave of terrorist attacks including the killing of 11 members of the team Charlie Weekly (January 2015) and 23 November in Paris that will include more than hundred dead at the Bataclan. The defeat of DAESH (2017-2018) does not mean the end of the ever present terrorist threat. In 2017, Emmanuel Macron was elected President in an extreme rise of context in France and in Europe, especially the far right embodied by Marine Le Pen supported by the so-called crisis « of refugees. Emmanuel Macron engaged in a policy of reforms (Labor law, SNCF, retreats …) to give France structures preparing for the future by not starting reduce the public deficit which hampered growing investment capacity of France and made dependent on sovereign wealth funds. Article suivant Non à Médine ! Catalyseur de haine. Vive la laïcité.